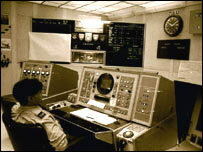 A US radar early warning system similar to RAF Fylingdales, is at the centre of an investigation into a cancer cluster. The role of Fylingdales on the North York Moors is being expanded as part of the United States' missile defence system. A BBC1 television programme shown in Yorkshire on Monday revealed there is concern about an almost identical base on Cape Cod. A US Air Force scientist Dr Richard Albanese tells the programme that radiation from the radar system may have carcinogenic properties. Dr Albanese was a member of the medical team that first identified agent orange - a defoliant used during the Vietnam war - as the cause of unexplained cancers in American veterans. He is now running the Cape Cod tests, which were ordered after local doctors identified raised levels of breast and lung cancer in young women near the Sagamore base 70 miles from Boston. Asked on the programme if he were to buy a house near RAF Fylingdales, which side of the radar would he choose to live? Dr Albanese said: "I'm medically very conservative and I would prefer to live outside the beam." "I think the concerns I have mandate the kind of action that is being taken - medical study, aggressive urgent medical study taking the path between alarm and complacency." Emissions from Sagamore and at Fylingdales are well within legal limits. But some researchers are now questioning whether the complex waves of electro-magnetic radiation should be subject to much tighter regulation. Dr Albanese said: "Technology seems to lead our medical understanding by somewhere between 10 and 20 years in almost every incident I have worked on." There is no evidence of a cancer cluster in the Fylingdales area. But the Yorkshire Cancer Register has confirmed that no research has yet been done near the base. Sophie Hull's report was screened on Inside Out on BBC1 Leeds on Monday.